I Received a Consent Order—Should I sign? 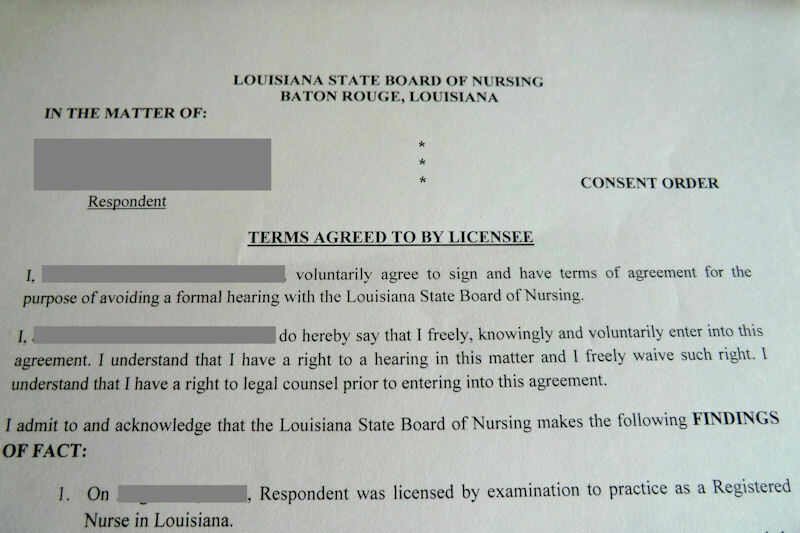 If you are a nurse who has received notice from the Louisiana Board of Nursing or the Louisiana Board of Practical Nurse Examiners about a possible license violation, you may be asked to sign a Consent Order. A consent order is a proposed disciplinary agreement where the nursing board sets forth conditions and restrictions to your license in lieu of having a hearing in front of the board. Before signing anything, your first step should be to contact a nursing license defense attorney. I strongly believe that nurses facing disciplinary action should not agree to any consent order without full legal representation. This is because it is important to know exactly what you are signing and how signing the order will affect your future rights. If you read the proposed consent letter that you receive from the nursing board, you will see a clause which waives your right to a judicial hearing if you violate the conditions of the consent order. Let me explain – when the nursing board takes action against you by formal complaint or at a formal hearing, you have the right to a judicial review of the board’s actions. However, if you sign a proposed consent order, that right becomes extremely limited if not terminated completely. For example, if a nurse signs a consent order that requires drug testing, which the orders usually do, and for reasons beyond their control they are unable to meet that condition — it could be that the drug testing center was closed and they missed their drug test deadline – the board of nursing can and will automatically suspend the nurse’s license without a formal hearing. If your nursing license is suspended because you have violated the conditions of your consent order, your rights for judicial review or for a formal hearing before the board are non-existent. Every consent order I have reviewed pretty much imposes an automatic suspension without review or due process/judicial review. It does not matter if you had a valid reason for violating your consent order or not. Since a nurse’s ability to fight the nursing boards’ disciplinary action is so restricted, I recommend not signing any proposed consent order. It will cost you attorney’s fees, however you need the protection. And what you should always remember about the nursing board is that the board’s goal is not to help the nurse, it’s to make sure that the public is protected from possible nursing misconduct. Their interests are contrary to yours – nurses should hire a lawyer immediately.